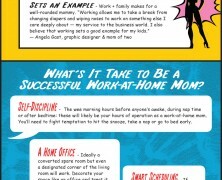 Modern moms enjoy flexibilty and prefer to work from home. Find the benefits and the prerequisites if you are seriously leaning to this option. Diving at the pool or drowning in work? 1/5 workers cannot afford to go on vacation but if they do many of them “move” their office on the beach for either catching up with tight schedules or satisfying their employer. If you wonder how to pump some energy to get back on the working field, these tips might be useful for you.